We mention first of Campo de Fiori in Rome’s sights in the morning you can visit for a while ‘shopping among the stalls of the market and in the evening to attend parties, take a look at the local and perhaps enjoy a typical Roman specialties. Do not fail to visit the Trevi Fountain which was made sculpting by Clement XII (1732) the construction and the project was entrusted to Nicola Salvi, Francesco Pincellotti, Giovan Battista Maini and Joseph Poddi. Do not forget to throw a coin and express your desire. The eighth hill of Rome or the Janiculum where there are numerous monuments to Garibaldi including the well known equestrian monument at the foot of which lies the cannon from which every day at noon shots are fired blanks. People’s Square has always been the place where the fairs were held but also a kind of cultural circle outdoors. It is accessed through the Porta del Popolo, the center of the square we admire the Egyptian obelisk of Ramses II. Beautiful and simple at the same time the Spanish Steps is framed by ocher buildings, decorated with the famous Four Rivers fountain from which rises the staircase leading to the church Trinita dei Monti. Among the monuments of Rome’s most majestic and ancient remember the Coliseum arena ordered by Emperor Vespasian and inaugurated by Titus in 80 AD originally designed to accommodate naumachie then fall into disuse and become hollow. We observe today the skeleton. 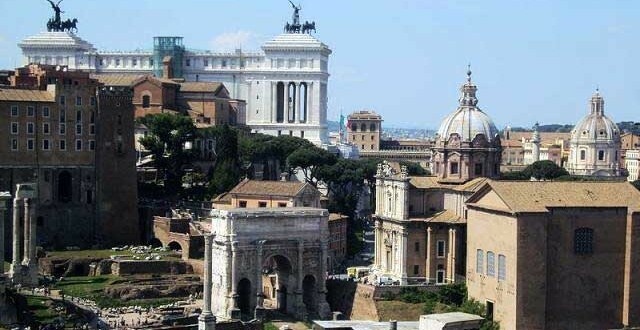 We report the Roman Forum or the heart of the commercial activities, and recreational giudiziare of Rome, inside you can see the remains of monuments such as the Basilica Emilia and the building of the Curia former seat of the Senate, the Basilica of Maxentius, the Arch of Septimius Severus and various temples. So we can take a stroll and a little ‘relaxation in the Orange Garden built by Raffaele De Vico (1932). We admire inside the fountain by Giacomo della Porta. Do not miss a visit to the Basilica of San Pietro surrounded by the famous colonnade inside which you can admire some sculptures of Michelangelo, Bernini and Carlo Fontana. Lastly is to visit Piazza Navona ordered by Emperor Domitian in 86 AD of which we admire the beautiful fountains: the Fountain of the Four Rivers by Bernini, north instead we see the Fountain of the Moor, sculpted by Giacomo della Porta and retouched by Bernini while to the south is the fountain of Neptune, the work of Gregory Zappala and Antonio the cleat.